This is a simple single stage mutli. The cache is not at the co-ordinates published, but is a short walk away. The Baptist Church at Harlington was officially formed in 1798, but was already in embryo-form some forty years before that, during which time John Attlee gave a piece of land to the dissenters for the building of a chapel. 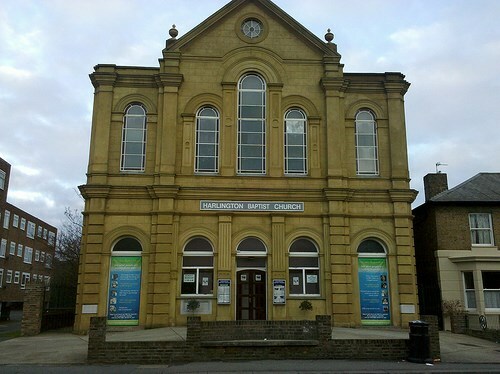 This now forms part of the present Church Hall (formerly called the Frank Peace Hall in memory of one of its ministers), and the plaque over the door bears the date 1775. When the Baptist Church was formed, in 1798, Harlington was a stopping and 'watering place' for horses en route from London to the West Country - a place where the weary traveller could rest. In those days the journey from Bath to London took upwards of two days - a far cry from the one-and-a-half hours it now takes by car. Harlington is one of the oldest villages in Middlesex, London known as far back as AD 831, when its name was given in the Saxon Cartularies as 'Hygereding Tun', meaning 'farm associated with Hygered', and again in the Doomsday Book as 'Herdintone'. Before the present day, 'Harlington' was known as 'Arlington', when that title was taken by Sir Henry Bennett, when he ascended to the peerage. The final cache can be found at at…. …..which is a short walk away, but it’s not in the church grounds so don’t look there.